The hill state came in the grip of severe cold after a blizzard lashed the high and mid-hill areas in the wee hours of the day. Manali and the adjoining areas experienced a fresh spell of snowfall today. The snowfall started early this morning. The Manali region was covered with a thick layer of snow. Keen on taking advantage of the national solar mission, the public sector Sutlej Jal Vidyut Nigam (SJVN) will make a foray into the renewable energy sector with a pilot solar power project in the state, to be set up alongside the Nathpa Jhakri project. 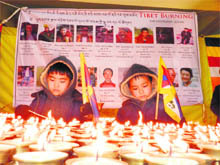 Tibetan exiles today organised a candlelight vigil at McLeodganj as part of their worldwide campaign to highlight the plight of Tibetans in Tibet, after reports of about 20 Tibetans committing self-immolation. A youth, Charanjit Singh (33), was found murdered near an industrial unit at the Dhaulan Kuan area of Paonta Sahib this morning. State Congress president Kaul Singh Thakur has challenged the misleading financial figures being propagated by state BJP leaders for denying financial rights of employees and pensioners and has demanded that the government should come out with a White Paper regarding the financial position of the state so that the people know the real situation. Nadaun MLA Sukhvinder Singh has taken up the issue of construction of railway line from Amb in Una district via Nadaun to Kangra, Dharamsala and Palampur in the state, with the Central Government. The future of over 534 students enrolled in Kendriya Vidyalaya (KV) here hangs in the balance. The school is facing closure as the Kendriya Vidyalaya Sangathan (KVS) has stopped fresh admissions this year as the state government has failed to provide additional land and accommodation for the school in this temple town for the past 26 years. Maheshwar Singh, president of the newly floated Himachal Lokhit Party (HLP) by BJP dissidents, today came in for severe criticism for possessing excess land in violation of the rules. The state government has decided to set up hydro-power projects in the tribal district of Lahaul and Spiti specifically to tackle the problem of silt confronting all major projects in the Sutlej basin, suffering losses worth crores due to non-generation. The Vigilance and Anti-Corruption Bureau has arrested two partwaris posted in Indora tehsil on a graft charge. Both patwaris have been arrested in separate cases. Activists of the National Students Union of India (NSUI) today wore black badges during the annual function of Baba Balak Nath College, Chakmo, to lodge their protest with the administration against alleged discrimination. Himachal Pradesh has been conferred the Best Investment-Friendly State Award in the independent “State of the States” survey carried out by Planman Media, a multi-lingual media group of the country. The students and faculty of the Indian Institute of Technology (IIT), Mandi, a recent upstart, had all smiles when a five-member team from Microsoft India, a global computer science giant, reached an understanding on innovative projects in computer science with the IIT after the team visited the institution on its makeshift campus here early this week to select students for the Summer Internship Programme. The Junior Engineers and Additional Assistant Engineers Association of the Himachal Pradesh State Electricity Board (HPSEB) has urged the government to fill 135 vacant posts of sub-divisional officer (SDO) directly through promotions from the junior engineer (JE) cadre to remove stagnancy in the power board. Deputy Commissioner Ritesh Chauhan inaugurated the issuance of computerised revenue records at the Bilaspur Sadar tehsil office here on Monday evening. In a rare incident, an antelope (barasingha) is said to have entered the premises of the main temple of Baba Balak Nath at Shah Talai, 72 km from here, this morning. State BJP president and MLA Khimi Ram Sharma laid the foundation stone of “gramin haat” near the bus stand in Banjar, 40 km from here, today. The location of the new branch of the State Bank of India approved for Tatool in Solan district earlier has been shifted to Slogara in the same district. The hill state came in the grip of severe cold after a blizzard lashed the high and mid-hill areas in the wee hours of the day. By the morning major tourist destinations, including Manali, Shimla, Kufri, Chail, Narkanda and Fagu wore an impeccable white mantle. 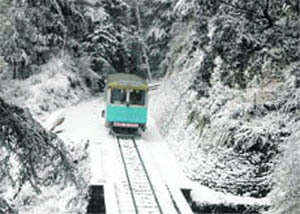 The tribal areas and higher reaches of Shimla, Kullu, Mandi and Sirmaur districts also had snow. Narkanda, Khara Pathar and Solang Nullah had received 40 to 50 cm of snowfall, while the Hatu peak, Churdhar and other higher areas had more than 60 cm of snowfall. Mount Jakhu, the highest peak of the city, had 30 cm of snowfall, while lower areas had 15 to 20 cm of snowfall. The nearby tourist resort of Kufri had 35 cm and Chail 20 cm of snowfall. The weather cleared in the morning, but only for a short while and it started snowing in the afternoon. The snowfall was continuing at the time of filing of the report. Om Praksh, 50, who was sleeping in an under-construction building at the Ram Nagar colony, was found dead in the morning. The police said he may have died of cold. Vehicular traffic to upper areas of Shimla district and Kinnaur was disrupted as snow blocked all roads beyond Shimla. The Kinnaur and Rampur-bound traffic has been diverted via Basantpur and that of Rohru through Vikas Nagar. Lower areas were having intermittent showers. Seobagh 35 mm, Gohar 24 mm, Tissa 21 mm, Rohru 20 mm, Rampur 18 mm, Banjar 15 mm, Kassauli 13 mm, Pandoh 12 mm, Jogindernagar 11 mm and Karsog and Sangrah 8 mm each were among the places which recorded significant precipitation. Snow and rain is considered good for both fruit and standing rabi crops. Apple growers in particular are a happy lot as almost the entire apple belt has been receiving snow during the current winter, raising hope of a good harvest. The snow will go a long way in charging the depleting water sources and ease the problem of water scarcity during summer. The fresh spell of snowfall has disrupted normal life and revived cold wave conditions in the entire upper Manali region. Hundreds of tourists who have converged on the tourist town of Manali from different parts of the country were delighted to see the town donning an impeccable white mantle. 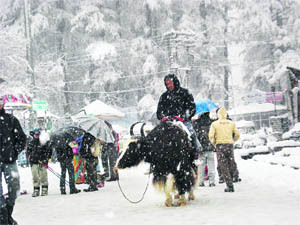 They came out of their hotels to have fun in the fresh snowfall on the Mall Road and the surrounding areas of the town. A joyful environment prevailed on the Mall Road and Nehru Park, the heart of the town, as winter revellers were seen having photo sessions, yak riding, skiing and throwing snowballs at each other. Due to the fresh spell of snowfall, traffic on the Manali-Rohtang Pass road was disrupted near Nehru Kund this morning. Tourists made a beeline for Nehru Kund where there was enough snow. Buses remained suspended this morning on the Manali-Solang and Kothi village road and the Manali- Nagger (left bank) road. Only light vehicles were seen plying on the road. The ski slopes of the Solang valley also experienced a fresh spell of snowfall. The moderate-to-heavy snowfall on the 14,000-foot-high Bhrighu slopes, the 12,000-foot-high Hamta ski slopes and the 13,050-foot-high Rohtang Pass, which are famous for its helicopter-skiing, also brought cheer on the faces of heli-ski lovers. The hydropower giant has already ventured into the field of wind energy with a 50 MW project and has decided to promote and develop renewable resources of energy in a big way. Under the solar energy initiative, it plans to add anything between 200 MW and 500 MW of solar power capacity during the mission, which will come to a close on 2022. During the entire mission to be implemented in three phases, additional solar power capacity of 20,000 MW is to be created in the country. The pilot project will come up at Kotla and Juri on land acquired by the SJVN for the Nathpa Jhakri project. Availability of land is vital for harnessing solar energy as on average about 5 acres are required for setting up a 1 MW project. The BHEL has already carried out a preliminary feasibility study for the pilot project and the process for preparing a detailed project report will be started soon. Executive Director of the SJVN RK Aggrawal said the pilot project would enable the company to select the best technology for harnessing solar energy. Major projects would be set up in Rajasthan, Gujarat and other states suitable for harnessing solar energy. He said with the declining cost of solar capacity addition, which had already come down from Rs 16 crore per megawatt to around Rs 12 crore per megawatt over the past two years, along with the facility of RECs (renewable energy certificates), solar power had become an economically viable proposition. The cost of solar projects would further dwindle and with the RECs fetching about Rs 10 per unit, solar projects would be quite attractive for power producers. The company has already invited tenders for setting up the 50 MW wind power plant on a turn-key basis at any suitable site in the states of Madhya Pradesh, Andhra Pradesh, Gujarat and Maharasthra. The estimated cost of plant is Rs 350 crore. However, the cost of generation is relatively high as the plant availability factor for both wind and solar power is very low compared to hydropower. All the members of the Central Tibetan Administration (CTA) and members of Tibetan parliament-in-exile, including Tibetan Prime Minister-in-exile Lobsang Sangay, participated in the candlelight march. Earlier, the prominent officials of the Tibetan government-in-exile organised a prayer at Tsuglakhang, the main temple of Dalai Lama at McLeodganj. The CTA also received messages from leaders and supporters across the world expressing solidarity with them on the issue of the self-immolations. The continued self-immolations being committed mostly by monks in Tibet has given a flip to the movement of Tibetans-in-exile after the March 2008 Beijing Olympics when mass protests were witnessed. The self-immolations started after the Chinese authorities laid siege to the Kirti Monastery in Tibet. Various members of Tibetan government-in-exile have been maintaining that the self- immolations are being committed by Tibetans as their patience was wearing out against the continued repressive policies of China. They have also maintained that the Chinese government was transferring a large numbers of the Han population into Tibet that has reduced the original residents into a minority. Most of the economic benefits due to the said development of Tibet have benefited mainly the Han population that is spreading unrest among the Tibetans. Tibetans are also protesting against the forced re-education programme of the China in which they are calling on Tibetans to denounce their “God King, the Dalai Lama”, the Tibetan authorities allege. Even the 17th Karmapa, Ogyen Trinley Dorjee, who since his arrival to India in 2000 has evaded giving any political statement, has issued a measured statement condemning Chinese policies over increased self-immolations in Tibet. He stated that projecting the Dalai Lama in a bad light would not be of any gain to China. The Tibetan PM-in-exile had demanded that a United Nations team should be allowed into Tibet to assess the ground situation. They have also demanded that the international media should be allowed into the disturbed areas of Tibet. China, on the other hand, has condemned the Dalai Lama for not openly denouncing the self-immolations being committed by Tibetans in Tibet. The Chinese authorities have maintaining that committing self-immolations were against the tenants of the Tibetan Buddhism and the Dalai Lama should condemn them. They have been maintaining that the Tibetan exiles have been using the self- immolations for political gains. The protests by Tibetan exiles are likely to increase in the coming days. His body was spotted dumped outside the rear gate of Merico Industries by some passers-by around 7am today, who later informed the police regarding the same. Additional SP Sanjeev Lakhanpal said the youth, who runs a tractor, was unloading some goods at Merico Industries last evening around 9 pm when his tenant Arjun Pandit took him away on some pretext. He was untraceable since then and his body was found dumped outside the rear gate of the factory. Intriguingly, no injury marks have been found on the body of the deceased. The police has sent the body to the Forensic Science Department of the IGMC, Shimla, for autopsy to ascertain the cause of the death. The police was now on the lookout for Pandit, who is missing since last evening. Pandit, who hails from the Ettawa area of Uttar Pradesh, had come here a few years ago and the police was now inquiring into his antecedents though no cause of rivalry or enmity had so far come forth. The factory register had been taken into possession to get some leads. A case under Section 302, IPC, had been registered. This was the second murder in Paonta Sahib subdivision in the past three days as earlier another body of a youth was found inside a gurdwara guest house. Talking to mediapersons at the Circuit House after addressing a largely-attended meeting of party workers and leaders drawn from across the district, Thakur asserted that the Congress was united and was in a position to dislodge the BJP government from power in coming elections. He stated that clean image, consistent commitment to party and the ability to win would be the three main criteria to decide candidates for the next election, which would be decided on the basis of a report regarding the three-man panel of party observers from each constituency. He denied the fact that he ever said that the earlier defeated candidates would not be acceptable for becoming candidates this time. Flanked by state General Secretary Ram Lal Thakur and District President Santosh Dhiman, and in presence of former MLAs Dr Babu Ram Gauttam and Tilak Raj Sharma and around 12 prominent leaders, including zila parishad members Hoshiar Singh Thakur, Jitender Chandel, Basant Ram Sandhu, Rajender Thakur, Bambar Thakur and Deepak Sharma, Kaul Singh made categorical declaration that the Congress government would legalise all encroachments by Bhakra Dam oustees of Bilaspur town and spend most of the money awarded to the state by the Supreme Court under the state’s 7.19 per cent share in the project, apart from allotting plots to remaining oustees and solving their other pending issues. A deputation headed by the MLA recently met Union Commerce, Industries and Textile Minister Anand Sharma and urged him to take up the matter with the Centre. Though Himachal Pradesh government had been taking up the issue of expansion of railway line in the state for many years, nothing much has been achieved in this regard. The present state government has been stressing on the need of expanding the railway line to Leh via Manali, emphasising strategic need for railway lines to strengthen security network along the Chinese borders. The deputation urged the minister to advocate the case of expansion of the railway line in the state and provide funds for the survey of proposed railway line in this year’s Railway Budget. The MLA said: “The minister has also taken up the issue with Union Railway Minister Dinesh Trivedi and urged him to make provision for initiating the survey of proposed railway lines and also allocate funds for the same in the Railway Budget 2012-13. Over 105 parents of students today gathered in front of the principal office in the school and later lodged their protest before the Mandi Additional Deputy Commissioner (ADC) asking the administration to provide more accommodation to the KV to accommodate fresh students. The parents also submitted a memorandum through the ADC to the Chief Secretary urging the government to provide land and extra accommodation for the KV so that fresh admissions could be started this month. The school did not admit fresh batch of students this year as the KVS has stopped admissions as the present accommodation is not enough to accommodate more students. The sangathan has asked the school not to admit students till the state government provides land or extra accommodation to the school, said the school principal, Shobha Sharma, expressing her helplessness. She added that the school had been running in a temporary building provided by the state here for the past 26 years. “We have 534 students and classes are being run in labs,” she said. Shobha said they have sent several reminders to the government, which is a sponsoring agency, to provide land or extra buildings, but to no avail. “Even we have requested the government to handover the building of primary school along the students, which is close to the KV, but the government has turned a deaf ear towards this proposal as well,” she rued. She said the KV had no alternative other than closing down the school in years to come. “The sangathan has already stopped taking fresh admissions for the Class I this year,” she added. The parents resented that the successive state governments has been giving false assurance to the KVS ever since the school was started here in 1986. Addressing a press conference here, Om Prakash Sharma, president of the Rupi Dehat Sudhar Sabha and zila parishad member from the Manikaran ward near Manali, levelled serious allegations against the BJP rebel who first floated an anti-graft outfit and later a political party. He demanded that the excess land in possession of Maheshwar should be vested in the government. Not only is the timing of the allegations against Maheshwar intriguing as both Shanta and Dhumal are meeting Gadkari in Delhi tonight to discuss party affairs, but also the fact that the allegations have been levelled by a Congress leader, as Sharma said he had been in the party for the past several years. “People who have themselves indulged in irregularities and have taken benefits owing to their position should not point fingers at others and talk of waging a war against corruption,” said Sharma. He alleged that Maheshwar, the scion of the erstwhile rulers of Kullu, was in possession of 86 bighas of land in violation of the norms after the merger of the Rupi estate in November 1957. He alleged that Maheshwar had also occupied one bigha of land at the Dhalpur ground in Kullu. Even though the Sutlej basin is already saturated with some of the biggest hydel projects, including Nathpa Jkahri, located on it, now a possibility will be explored to have projects which can check the problem of silt. The excessive silt-carrying capacity of the Sutlej waters, especially during the monsoon, affects generation, resulting in huge losses. “We are now planning to set up power projects in Lahaul and Spiti, not with the objective of generating power, but to arrest the problem of silt which has become a curse for some of the biggest projects located in the state,” confirmed Deepak Sanan, Principal Secretary, Power and Revenue. He admitted that such a proposition would be financially challenging as the cost of such projects would be on the higher side but then all independent power producers (IPP) would be asked to pool in resources to find a permanent solution to the problem. The generation at all major projects, including the 1,500 MW Nathpa Jhakri project set up by the Sutlej Jal Vidyut Nigam (SJVN), comes to a halt whenever there is heavy rain. The heavy silt makes it difficult to run the turbines, resulting in huge losses. In fact, the IPPs having projects in the Sutlej basin, too, have been deliberating upon ways and means to tackle the problem of silt, but so far no decision has been taken in this regard. About five years ago, the Nathpa Jhakri project suffered a loss of almost Rs 200 crore in a year as the generation could not be undertaken for 22 days. With the SJVN taking several steps to arrest the problem of silt, generation could not be undertaken for about nine days in 2011, resulting in a loss of over Rs 80 crore. The SJVN authorities admit that the coming up of projects upstream like the Karcham Wangtoo on the Sutlej has helped them and now they get less silt than previous years. They point out that it is by way of water and machine management that the problem of silt is being tackled at the Nathpa Jhakri project. To avoid damage to the machinery, hard coating is undertaken to enhance the life of the blades and a machine overhauling facility has been created at the plant site so that heavy equipment does not have to be carted over long distances. taking Rs 1,000 from the complainant. In the other case, Hoshiar Singh, a resident of Raja Khasa village in the Indora area, informed Vigilance and Anti-Corruption Bureau officials that Vinod Kumar, posted in Raja Khasa circle, demanded Rs 1,000 for issuing the revenue records of his land against which he wanted to raise a loan from a bank. The patwari was arrested by a Vigilance and Anti-Corruption Bureau team while taking the bribe from the complainant. Both patwaris have been booked under the Prevention of Corruption Act. Local MLA Baldev Sharma was the chief guest at today’s function in which students from all educational institutions run by the trust participated. NSUI activists Subhash, Som Dutt and Neeraj said the NSUI activists wore black badges in the annual function in protest against the college and district administration’s discrimination in dealing with activists of different students’ organisations. They alleged that when the NSUI and SFI activists were elected to the college SCA they were not allowed to celebrate the victory and even the SCA president was not allowed to address the students in the annual function, while the SCA president owing affiliation to the ABVP shared the stage with the chief guest. The state was ranked at the top position in the country on the basis of the survey. Chief Minister Prem Kumar Dhumal said he received a communication in this regard today. He said with this the tally of the awards bagged by the state over the 49-month tenure of his government had gone up to 55. The Chief Minister said it clearly indicated that the NDA-ruled states were performing better than Congress-governed states. He said it was an honour for the people of the state who were the driving force behind all such achievements and thanked them for their continuous support to the policies and programmes of the government. He said students here had good exposure in spite of being a new IIT. “The curricula are impressive and the IIT is doing better than many others and we have arrived at some understanding to look for some projects and campus placements, he added. Dubba said they have also requested the Director, Mandi IIT, that the company would like to be here as the first company for campus placement in December this year, roping in the top talents available here. About Microsoft, he said the campus at Hyderabad was the largest in terms of people and business that Microsoft had in any place outside the United States. The Director of the Mandi IIT told Mahender Dubba that this IIT would be happy to work on long-term innovative projects with Microsoft. “We hope Microsoft would expand its talent search beyond computer science students and think of looking for talents in other streams like electrical and mechanical engineering as well,” he added. Newly elected president of the association Ram Dev Agnihotri thanked the state government, especially Chief Minister PK Dhumal, who also holds the charge of Power Minister, for increasing the promotion quota of junior engineers from 38 to 40 per cent. He said the new body of the association would soon finalise a demand charter and put it before the board management. The other office-bearers of the state body are general secretary Daleep Singh Dadwali, senior vice-president Budhi Singh, vice-presidents Thakur, Bhupender Thakur and Balbir Chaudhary, additional general secretary KS Guleria and treasurer Suresh Sharma. He delivered land ownership papers to farmer Mahender Singh of Harnoda village, near here, as he had recently purchased land in nearby Jamthal village and got its registration done just then here. issued there and then at a click of the mouse in the tehsil office. The DC said this system was being introduced in all tehsils of the district and it would provide relief to farmers and the revenue staff as it would save time and money also. All these documents would be attested by the tehsildar then and there. He said this system would bring transparency in revenue works and land records would be updated easily. It would also make available all the revenue information at the same time and help solve controversies and disputes without any delay. Tehsildar, Bilaspur Sadar, GR Bansal and officers of the Revenue Department and other district officers were among those present on the occasion. Eyewitnesses, including devotees from Ludhiana (Punjab), said a number of people, who had never seen this otherwise shy and scary but harmless wild animal, were surprised to see it in front of their eyes as it suddenly appeared from the nearby Sarhali khud side and jumped the high wall of the Primary Health Centre and then the railing of the temple premises. Finding a number of people all around, the baffled antelope got scared and ran here and there and then succeeded in getting out of the temple premises after its several running rounds. It disappeared within a couple of minutes taking a number of frantic long and high jumps for its life. In his address at the annual function of Government Senior Secondary School, Banjar, he said the state was spending 19 per cent of the Budget on education, which is the highest across the country. He was the chief guest on the occasion. The smart class programme was started in 628 schools in the state under which the Banjar school was also provided with modern ICT Lab, LCD and projector costing around Rs 12 lakh. He said Rs 16 lakh would be made available soon for construction of a teaching room in the science block and a boundary wall and stated that by laying of foundation stone for polytechnic college in this district by the chief minister has opened new spheres in technical education. Earlier, DP Sarvata, Principal of the school, presented the annual report and thanked parents and other guests. Cultural programmes were also presented by students. The chief guest announced to reward them with a sum of Rs 2,100 and gave prizes to students. District BJP vice-president Devraj Tyagi, zila parishad member Kirti Shouri, BDC president Kirna Thakur, SDM Virender Sharma, panchayat members of the region and other dignitaries were among those present. An official spokesperson for the bank said according to the the revised decision, the branch was opened at Slogara on Wednesday.